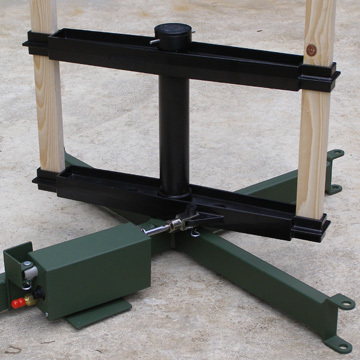 The SPTargets Cross Base Turning Target is an excellent choice for both portable and fixed-installation ranges. Intelligent target design provides effective training and minimizes down time in use in the field. When used in portable systems the center shaft of the target can be quickly removed permitting several target bases to be made into an easily handled stack that is convenient for transportation and storage. Tough construction ensures low maintenance and permits year round outdoor operation. SPTargets has many targets that have been in use permanently out-of-doors for 6 years or more with no maintenance. Wide base provides stability in windy conditions. Brackets with holes at the end of each leg allow the target to be staked down on bare earth or bolted down to a concrete slab. Industrial plastic bearings between the moving parts remove the need for periodic lubrication. This is of particular benefit in dusty environments where lubrication of bearing surfaces is actually detrimental. The steel components of the targets are protected by a very tough, powder-coated paint finish. The paint color is available in our standard military matte green or in a “safety yellow” finish. The target uses our extremely strong and durable injection molded filled nylon rotating target frame. This target frame reduces the possibility of ricochets and it is inexpensive to replace when damaged. Legs - 1 x 2 inch steel tube of 0.09 inch wall thickness. The target operates from 12 or 24 volts DC supplied from the control system receiver. Typically a portable target system will operate from 12 volts DC and a fixed system operates from 24 volts. The weight of the complete Cross Base Turning Target, assembled for use, is 15 lbs.